Months ago we brought you the details of IHG Rewards Club's Double Airline Miles offer where people who don't want to earn IHG Rewards Club points and would rather funnel their IHG stays to earn miles in their airline or in this case AIR MILES accounts. 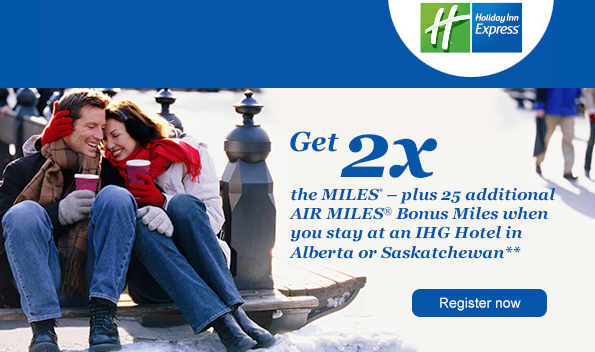 Well the double AIR MILES Reward Miles offer is getting a boost for IHG stays in Alberta and Saskatchewan. For the remainder of this month if you are registered for this promotion (you can do so via the link below) you will earn an additional 25 Reward Miles on top of the double miles.